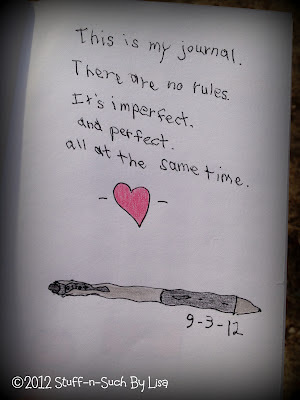 The Lil Journal Project - Inspiring Creativity One Day at a Time! 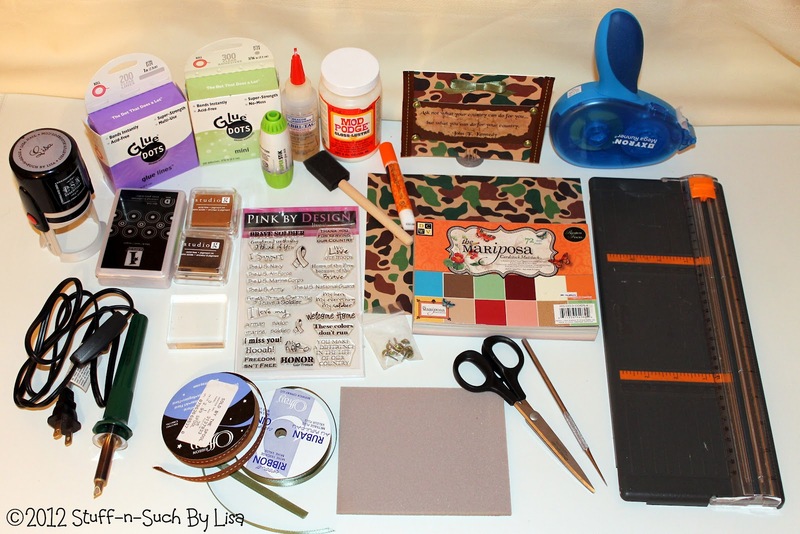 I'm always looking for new ways to get inspired and recently one of my favorite blogs "Lil Blue Boo" began a series on journaling called "The Lil Journal Project". I used to keep a journal as a young girl, so I was immediately intrigued and was excited to get started after reading her post! 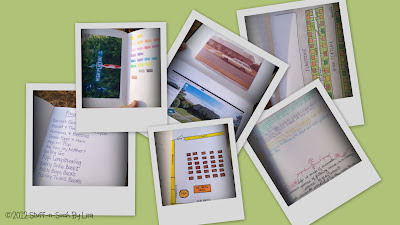 Ashley provides daily prompts to help you along in your journaling adventure. This is something I need desperately. I've always wanted to start keeping a journal again and in the past have attempted to. Mostly these journals were very boring and certainly not fun for anyone to read or look at! 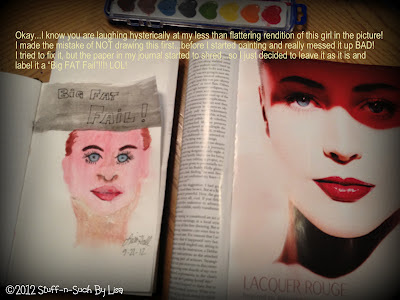 The type of journal featured on Ashley's blog is a more creative type journal, in the sense that it not only contains writings and musings, but artistic things as well...such as drawing, painting, epherma, photos etc. The thing I love most about it is...ANYTHING GOES! 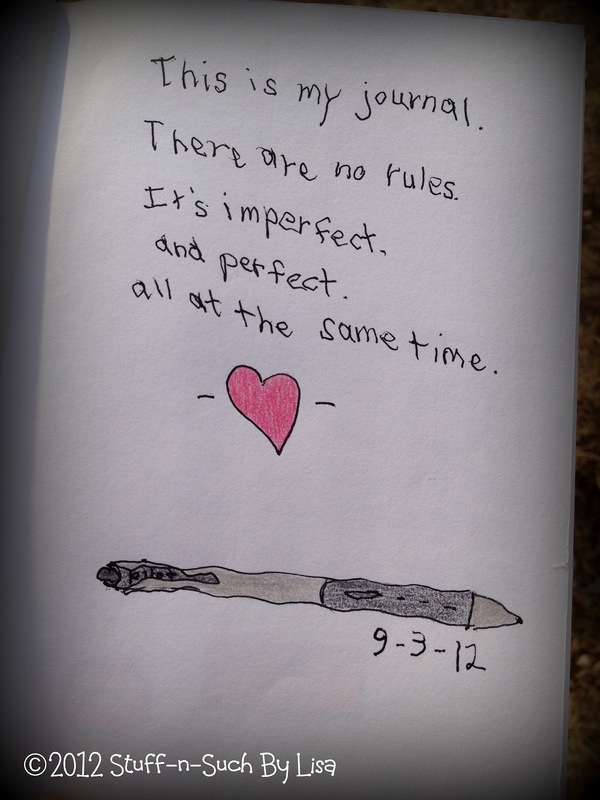 It's your journal, your way. I haven't been great about keeping up with every prompt every day, but I've done as much as I can and am enjoying it thoroughly! It's such a great idea to get your creativity flowing especially if you're like me and you have trouble in that area. I did this drawing on my iPad using an app called "Doodle Buddy". 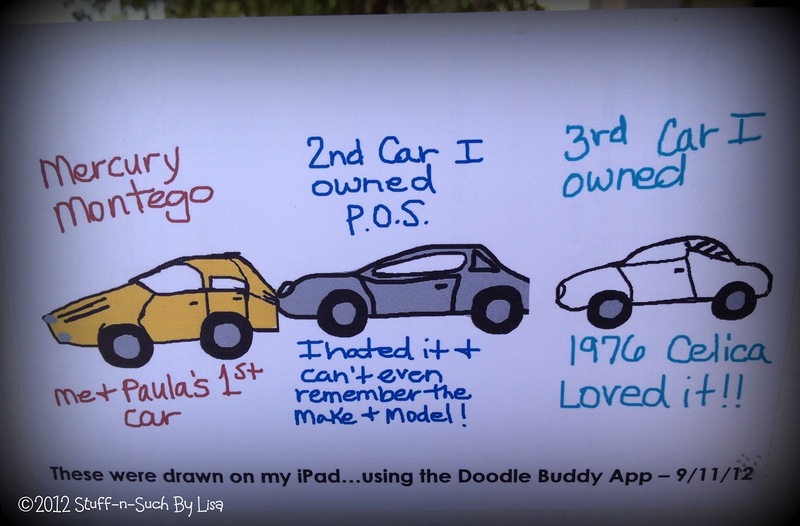 I LOVE using that app and "pretending" I can draw! 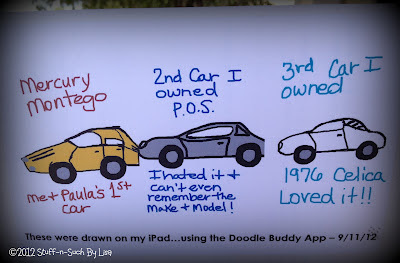 Obviously, I did not "complete" the "My Life in Cars" section yet...I've had WAY more than 3 cars in my 50+ years of life, but since it's such a struggle for me to draw...It might take me awhile to get to all of them. As you can see...I certainly am not very good at drawing or painting but as the first journal prompt and entry shows, I am imperfect and perfect at the same time...just as my journal is! I need to let go of the idea of perfection...it is something that has held me back for years, especially when it comes to being creative. So many times I have begun a project just to be disillusioned because I feel like it's not good and no one will like it. I am my own worst critic! I know what everyone says about negativity and I have fought my whole life with it but it's always been part of me as I was raised with a father who demanded perfection of those around him. I never quite felt like I measured up to his standards but that's a post for a whole other blog! In addition to that almost impossible standard...my Grandmother (my Father's Mother) was a very accomplished artist and I sometimes felt like I fell so short of her talents, even though I admired her and always hoped that I had inherited some of her artistic abilities. 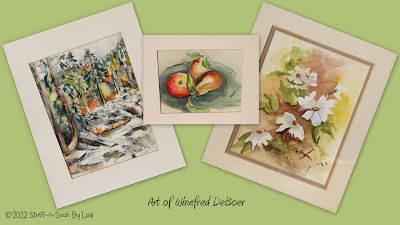 She was mostly a painter and her favorite mediums were watercolor and oils. I'm hoping by doing this journal, I will be more open to just "create" and not worry if it's wrong or right or if anyone will like it. I think it will help me a lot...it's great therapy! If your like me and struggle to know where to start or what to journal about, then Ashley's "The Lil Journal Project" would be perfect for you to follow! 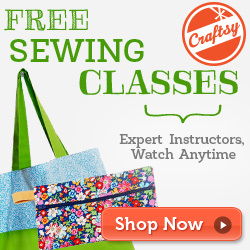 Check it out and join me on a new creative journey! I've been away for awhile… summertime is so busy for me and hubby that it's hard to stay on track with my blog! In between our summer trips and my latest sewing project I decided to make a card and even though Veterans Day is several months away I decided to go with that theme for this card. This card can also be used as an Operation Write Home “Any Hero” card. If you haven't heard of Operation Write Home you can learn more about it here. 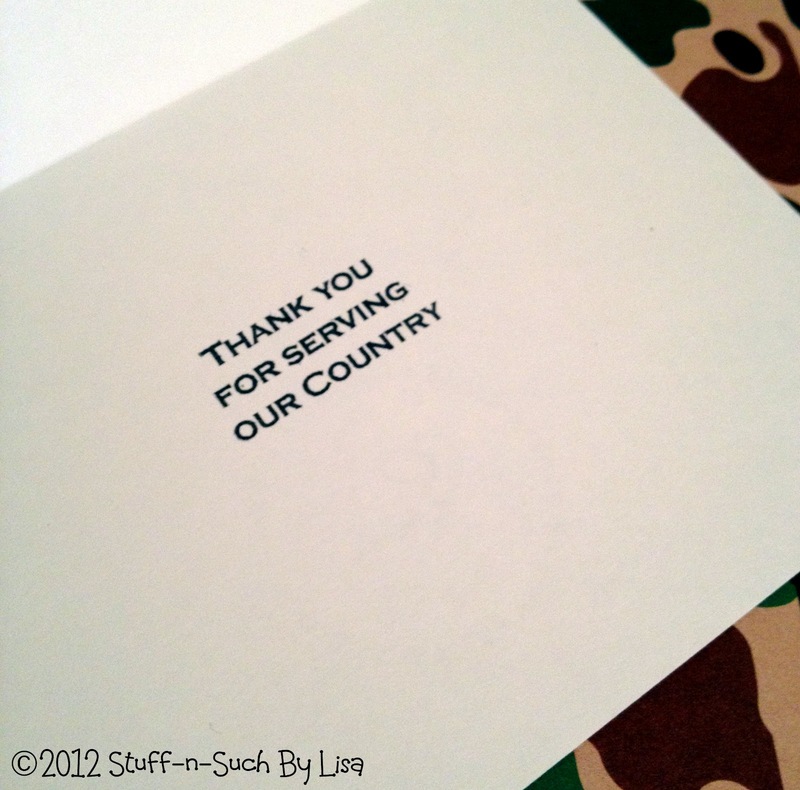 It is an awesome organization that supports our troops by sending blank handmade greeting cards to them in the field, where they often do not have access to these items. 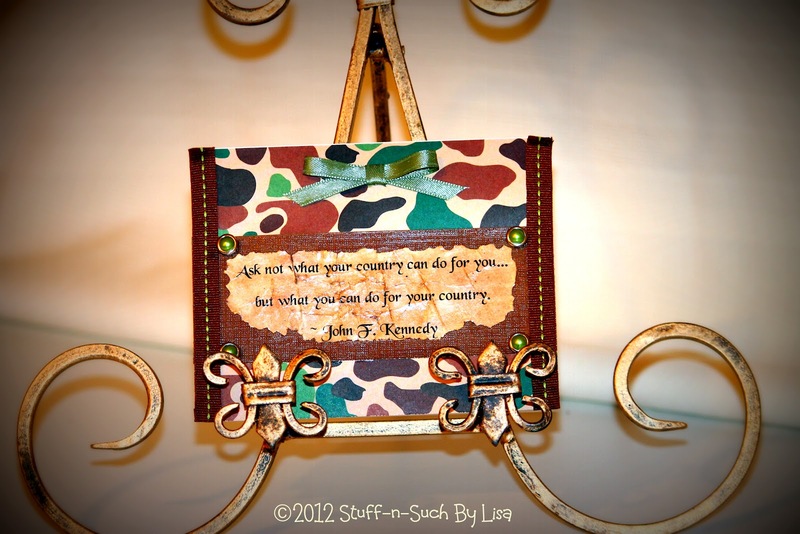 I come from a military family and currently have a son who is in the Army guard and a son-in-law who is in the Air Force so these type organizations are near and dear to my heart! In addition Veterans Day is an especially important holiday for our family as we have a long legacy of relatives who have served this country proudly and we are most grateful to them and all the troops past and present who have served this wonderful country! 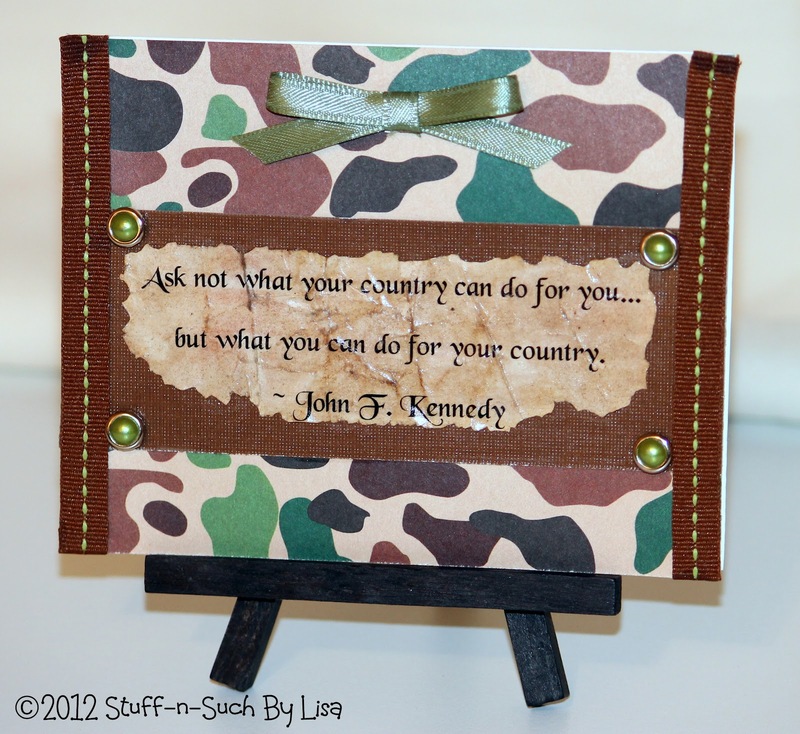 For this card I wanted a special message of thanks, so I searched the Internet for famous military quotes and came up with one by John F. Kennedy one of the most famous ones no doubt! I felt it was really appropriate for this card. I typed the quote into a Microsoft Word document and then printed it out on my laser printer. I decided that I wanted to give the quote a bit of an aged and distressed look, so I wrinkled up the paper and stained it using brown ink and then dyed it further using coffee. After that, I used a wood burning tool to burn around the edges of the quote. I used Mod Podge to glue down and seal the quote on the cardstock. On the inside I stamped a sentiment from the Pink By Design Stamp Set: “Our Troops”. I stamped the back of my card with an "OWH" stamp and my custom stamp from PSA Essentials. Offray Grosgrain Ribbon, Brown with Green Stitch, 3/8"
Berwick Offray Spool O' Ribbon - Poly/Satin Ribbon, Olive Green, 1/4"
Glue Dots, Glue Lines, 1"